When you file a bankruptcy case, a court order, called the automatic stay, immediately goes into effect. It orders your creditors to stop trying to collect debts. Activities prohibited by the automatic stay include filing most civil lawsuits and continuing to litigate most lawsuits that are already on file. The purpose of the automatic stay is to preserve the debtor's property, so you may get to keep your property, if the law considers it exempt from liquidation in bankruptcy. The automatic stay also keeps creditors from competing to take the debtor's non-exempt property. Instead, non-exempt property is preserved, and when sold, each of the creditors receives a share of the proceeds from the sale of the property. Violations of the automatic stay can be punished in two ways, depending on whether the stay was violated by a person, a business or the government. If an individual violates the automatic stay, the bankruptcy court can assess damages against him, plus punish him by awarding punitive damages. The court also can award you court costs and attorney's fees. If a business or the government violates the automatic stay, the entity can be held in contempt of court. The automatic stay prohibits many types of civil lawsuits, including suits to collect debts. These lawsuits are stopped until the bankruptcy process is finished, unless the bankruptcy court lifts the automatic stay. A creditor who has a lien on your property -- for example, the bank that holds the mortgage on your house -- can petition the bankruptcy court to lift the automatic stay. A creditor may not attempt to foreclose on your house or repossess your car unless the automatic stay is lifted. Bankruptcy courts can lift the automatic stay and allow the lender to proceed with foreclosure if the debtor quits paying his mortgage. 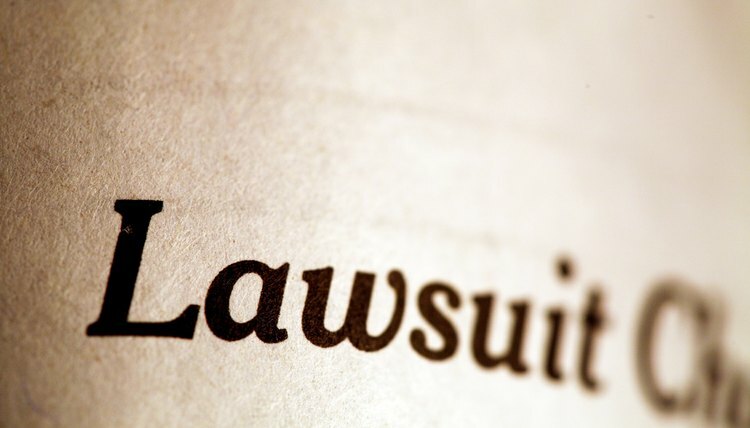 A common type of civil lawsuit pertains to family matters, such as suits for divorce and suits to establish, modify or enforce alimony obligations or child support. The automatic stay does not apply to most of these types of suits. However, the automatic stay does apply to the property-division part of a divorce case because that property is potentially part of the bankruptcy estate. The automatic stay must be lifted, or the bankruptcy concluded, before a divorce court will divide the property of a person who has filed for bankruptcy. A & L, Licker Law Firm, LLC: What Is an Automatic Stay in Bankruptcy? Lee Law Firm, PLLC: What Is the Purpose of Automatic Stay? United States Department of Justice: Automatically Violating the Stay? The bankruptcy laws pertaining to limited liability companies are hazy. The United States Bankruptcy Code contains no specific provisions for LLCs, so bankruptcy courts often look to state laws to decide what to do when such a company files for protection. However, some trends have developed since states began to recognize LLCs as legal entities in the 1980s, even though there are few hard and fast rules.